A new study from the University of Liverpool has recommended that the well-being of both pets and their owners can benefit from education and pet-friendly facilities. During the study, it was found that an estimated 40 percent of dog owners do not walk their pets, which could be a contributing factor to dog obesity. Canine obesity can have the same serious health consequences as people (diabetes, heart disease and joint issues). It is also believed, obese owners may be more likely to have obese dogs, perhaps because they are less likely to exercise their dog, or less able to recognise obesity. The study found the two main reasons people were not walking their dogs were: not being informed on how much was needed and having limited access to dog friendly areas. 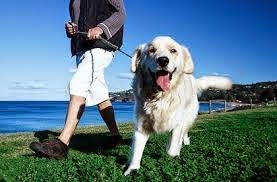 Walking is a great form of exercise and can be beneficial for you and your pet. People who did not have access to high quality areas that support dog walking (dog parks that allow dogs off leash and provide waste disposal facilities, for example), were much less likely to walk with their dog. People were just more motivated to walk when the area was more conducive. Many pet owners did not have the knowledge of how much exercise their pet really needed (150 minutes of physical activity a week is recommended) , or the the health benefits that could be obtained from walking your furry friend. A coordinated effort to educate pet owners could have a great impact, the study showed that those that were aware, were much more likely to walk their dogs. The stronger the dog-owner bond, the more likely they were to take them on regular walks. Anxiety over their pet's behavior also had an impact on how often people would take their pets out. Training your pet to be a good citizen is always important, but it could also lessen this fear and make it a fun time for all.